Aight... I have been meaning to do this for a while. I am going to review an album by an artist that I feel like from time to time just so y'all know where I stand when it comes to music. Now first and foremost, don't get it twisted. This is not Vibe, the Source, XXL, Blender, Rolling Stone, etc. this is Chris reviewing whatever the f- music he feels like at the time/can get his hands on. I will keep it real and pull no punches. Don't get upset if I don't like your favorite artist. I don't care if you met the love of your life while dancing to an Ashanti song, if I think she can't sing then dammit that's how I feel. Anyway... Its time for the music. her buttocks clap like those little clackers with the balls that like tick one at a time. Its about sitting car, singing "OH, I CAN'T BELIEVE! "with your eyes closed and your head back while the people in the car next to you at the light wonder if you are in excruciating pain. 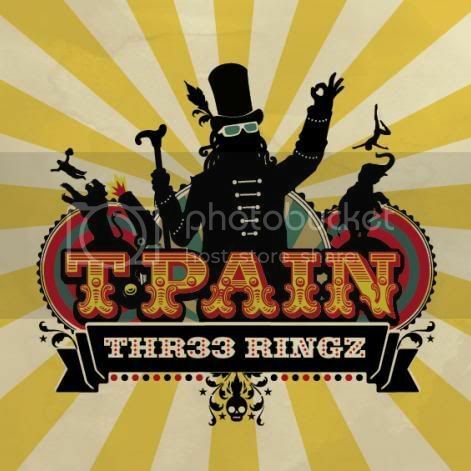 With that being said, Thr33 Ringz is an album full of singles and club bangers made for people to dance to and have a good time. In a day and age where R&B is hyper sexual, Hip Hop is full of fake drug kingpins and studio gangstas, Thelonius Pain makes fun, funny, music that everyone can dance to. Honestly, I could play quite a few of these tracks for like my parents and their friends (provided they were edited) and I think they would dance to it. Simply put, the album is a banger. Great features including Kanye, Weezy (enough said for most of you Weezy heads out there), Luda is back on his Word of Mouf funny flow type stuff, Ciara, Chris Brown (more on that dude later), Akon, and even Mary J. Blige and Musiq for you R&B purists out there. Now... Diddy and DJ Khaled make appearances and are counted as features but... DAMMIT neither one of them sings or raps. They just ad lib. More thoughts on those two in later posts. Tracks that stand out: Chopped n' Screwed, Freeze, Blowing Up, Therapy, Karaoke.